The Handbook of Chemistry and Physics has been the benchmark of scientific reference since the days of Einstein, Eddington, and Planck. 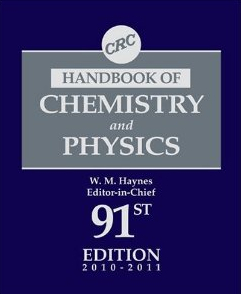 It is now in its 90th edition. No book is held to a higher standard. Any misspellings, miscalculations, misperceptions, and misnomers are revised as it is republished every year and no mistake remains for long. The job of editing the Handbook requires not only one who is relentless, driven to perpetually push the level of accuracy one more decimal point, but also one who is humble enough and smart enough to understand the Handbook. Of course it takes a scientist to edit the only scientific handbook that can be rightfully called The Handbook. For 20 years, we have seen the name of Dr. Lide embossed on the cover of the Handbook as editor-in-chief. Now a new name is embossed in silver: William M. Haynes. Dr. Mickey Haynes brings with him the most absolute qualification: a career devoted to finding and capturing the best data. Most notably, Dr. Haynes worked more than 3 decades for the National Institute of Standards and Technology (NIST). His last three years at NIST were as Chief of the Physical and Chemical Properties Division and currently he is a scientist emeritus with NIST. During his tenure, he was involved in major projects on the properties of natural gas, cryogenic fluids, air, alternative refrigerants, and ammonia/water systems. He was responsible for the development of apparatus for measurements of both transport and thermodynamic properties of fluids and models to represent the data. Dr. Haynes is Editor-in-Chief of the International Journal of Thermophysics and a Fellow of the American Physical Society. With his background, Dr. Haynes’ influence will be especially significant in the fluids property data, which he has already expanded for the 91st edition. But it hardly stops there, for like Dr. Lide and the editors before him, Dr. Haynes is already proving himself relentless with his efforts to make all the data more reliable and more stable. With the 91st edition of the Handbook to be released in June, a changing of the guard takes place. Mickey Haynes joined the National Institute of Standards and Technology (NIST) in 1970 as a National Research Council Postdoctoral Research Associate after completing his Ph.D. in physics at the University of Virginia. During this associateship, he carried out an experimental program on the viscosity of cryogenic fluids. In 1972 he became a permanent staff member and was involved in research on measurements and correlations of the thermophysical properties of fluids and fluid mixtures of scientific and industrial interest. He was involved in major projects on the properties of natural gas, cryogenic fluids, air, alternative refrigerants, and ammonia/water systems. Mickey was responsible for the development of state-of-the-art apparatus for measurements of both transport and thermodynamic properties of fluids (e.g., magnetic suspension densimeters and torsional crystal viscometers). The apparatus were used for fluid thermophysical property measurements at low and high temperatures and at extreme pressures; and for the development of empirical and theoretical models for the prediction of fluid properties. 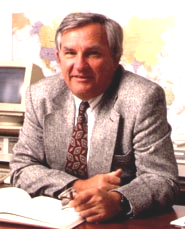 In 1985, Mickey became Group Leader of the Properties of Fluids Group in the Thermophysics Division and served in that capacity for ten years. In 1989 he assumed the position of Deputy Chief of the Thermophysics Division, which was reorganized and became the Physical and Chemical Properties Division in 1996. While remaining in the Deputy Chief position, Mickey became the Assistant Director for Boulder of the Chemical Science and Technology Laboratory (CSTL) in 1994. He stayed in these positions until becoming the Chief of the Physical and Chemical Properties Division in 1999. Mickey remained in this position until he retired from the NIST in January 2003. Mickey served on the Editorial Boards of the Journal of Chemical and Engineering Data, Review of Scientific Instruments, and Cryogenics. At the request of the ASME Heat Transfer Division Committee on Thermophysical Properties, he was Chair and Organizer of the 13th and 14th Symposia on Thermophysical Properties in 1997 and 2000, respectively. Mickey has been previously active on ASTM Committee D03 on Gaseous Fuels (Chair of the ASTM Subcommitte D03.08 on Thermophysical Properties) and the ASME K-7 Committee on Thermophysical Properties. He has recently served on the International Advisory Committees of the 16th and 17th European Conferences on Thermophysical Properties, the 6th and 7th Asian Thermophysical Properties Conferences, and the 17th IUPAC Conference on Chemical Thermodynamics. Mickey was elected as a Fellow of the American Physical Society in 1999 and has received several Department of Commerce (DOC)/NIST awards. Since his retirement from the NIST in 2003, Mickey has remained active in several areas. Presently, he is a Scientist Emeritus in CSTL. He has been the Editor-in-Chief of the International Journal of Thermophysics since 1997. Mickey was the President of the Executive Board responsible for organization of THERMO International, a joint conference comprised of the 16th Symposium on Thermophysical Properties, the 19th IUPAC Conference on Chemical Thermodynamics, and the 61st Calorimetry Conference held in Boulder in August, 2006. He has been a member of the ASME K-7 Committee on Thermophysical Properties since 1992 and is currently serving on the Touloukian Award Committee. Since 1998, Mickey has been a permanent member of the International Organizing Committee of the European Conference on Thermophysical Properties; he has also served on the International Advisory Committee of the Asian Thermophysical Properties Conference. Much of the material for this article comes from an editorial review of the book on Amazon. That link is here.